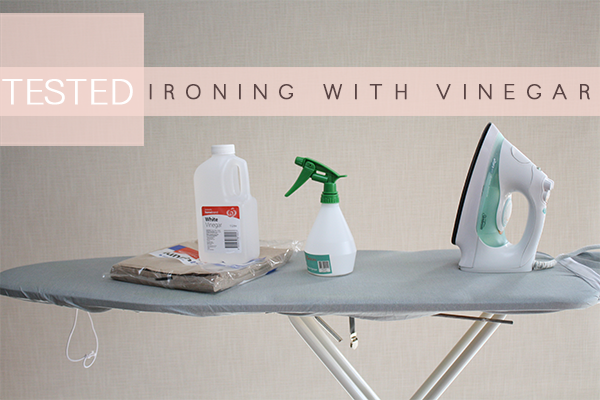 Well my friends, as promised, after our chat about my permanent skirt crease – i tested out this whole ironing with vinegar thing. And i have to say, i am pleasantly surprised! I decided to test it out two different ways so i could see which i prefered. First I tried Claire Shaeffers method of the paper bag wet with a 50/50 mixture of water and vinegar. I decided to do this only on the right side so i could compare the two methods easily. I laid the paper bag over the area to be pressed, held my breath and pressed with the iron. And guess what? the permanent crease was gone! 50 gazillion points go to my hero Claire Shaeffer! I gave it the sniff test, and the skirt didn’t smell of vinegar at all, not even a hint. I liked it so much i did the back too. I am really impressed with how well this worked! I’m still intrigued by why a paper bag was suggested – but i’m thinking perhaps it’s intention is to act like a presser cloth, so you’re steaming with vinegar rather than wetting the actual fabric. I think next time i’ll try this with my presser cloth and see what happens! 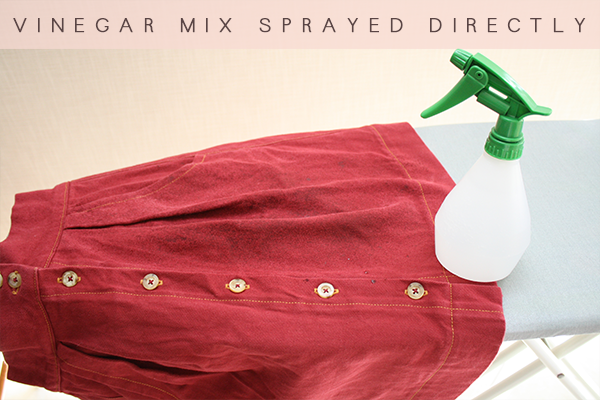 Next i tried spraying the 50/50 vinegar mix straight onto the skirt. I sprayed only on the left side this time, once again so i could compare the two. This worked well, but definitely not as well as the paper bag method. 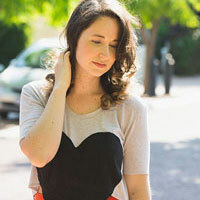 The crease looks better – but definitely hasn’t disappeared on that side completely. After the sniff test, i could still smell vinegar. It wasn’t tragic, but it did smell like vinegar. To be honest though, almost everyone who commented on last weeks post about successful vinegar ironing said they used something closer to 1/4 vinegar and 3/4 water – so i have a feeling my vinegar smell would have been much less significant if I’d used a more diluted mix. Final thoughts? 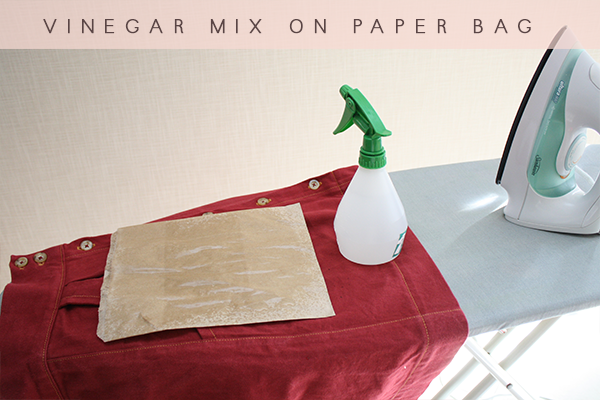 I’m pretty sold on ironing with vinegar now – but i’ll definitely lean more towards using it in conjunction with either a presser cloth or a paper bag. I’m also planning on trying the diluted mix. I feel like using the paper bag resulted in a much crisper pleat than the direct spraying, which i liked. I’m not sure this would replace my beloved steam press (yet to be unpacked from boxes… sad face)- but i’d say it’s a pretty darn good substitute! I’m happy to hear it warked, i was intendend to prove it but, my pile of clothes to be ironed is still growing out of control!! It works very well pressing crease in pants also, my mother used to do this when I was young. THE CREASE STAYS IN AFTER WASHING AND DRYING. This is seriously insane that it works! What bogles my mind is how in the world Claire Schaeffer discovered this technique. 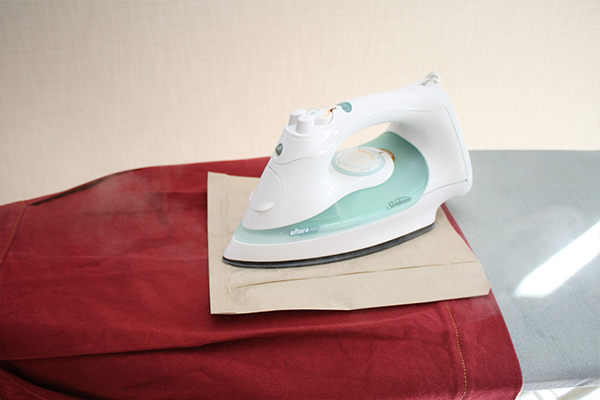 I mean, common, who would think to iron with a wetted paper bag. I jotted this down for the future! Thanks for the tip regarding vinegar. I’ve never used it before but I’m happy to know it’s an option. In the past, I’ve used a rajah pressing cloth to set pleats, and I was very pleased with the results. 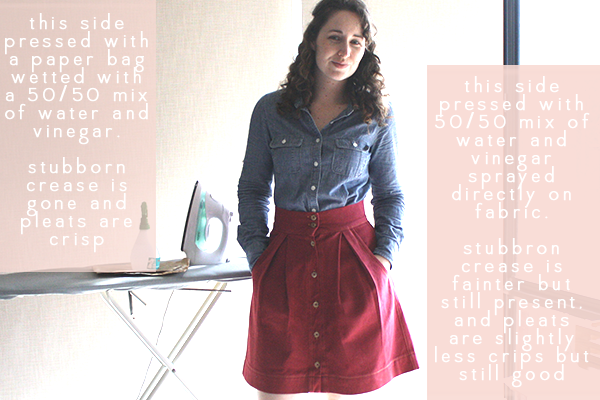 The pleats are permanent and have lasted through many washes. I use a rajah too – i have to say, it really changed my life when i started using one. They truly are brilliant. So glad you’re getting great results from yours!!! Hopefully you’ll have as much success as i did when you get a chance to try it out!! Yowza! Timely post. I am so, so frustrated with the ironing scene when it comes to merely ironing the wrinkles out of fabric. Question: Not sure I understand the wetting-the-bag procedure. Do you saturate the bag so it’s completely wet and iron over it or do you simply spray one side of it, iron on top of it and the vinegar mix seeps through? Sorry to ask a stupid question, just want to try this as it seems miraculous to me! Thanks so, so much for sharing! Hey Stacey!! Honestly, i was little confused on the strategy for wetting the bag too!! At first i thought soaking it was the right way to go – but i lost my nerve because i was worried the bag would be too soggy and fall apart. So i ended up using the spray bottle to spray one side. I first tried ironing on the wetted side and then ironing on the dry side with the wetted side facing down. I don’t think it makes too much difference, but i found i liked ironing on the wet side most, because it was easy to see when it was dry. I hope that helps! Meanwhile, it seems totally miraculous to me too! I still can’t believe how well it worked!!! Thanks so much for the details, Meg!!! I really appreciate your time and explanation. A lttle off-topic, but under the heading of “who would think…?” to revive day old biscuits, place in a paperbag soaked with water, fold the top closed, place in a preheated 350 degree oven for 10 min or so. Works like a charm. Who does think of these things?